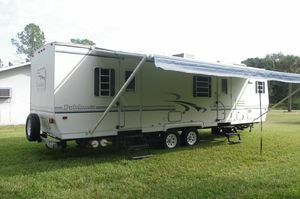 This aluminum frame and fiberglass travel trailer has a front kitchen floor plan with two entry doors. It features a sofa and dinette Slide-out, full pantry with door, bath tub/shower in the bathroom, raised panels on cabinets, doors and refrigerator, day/night window blinds, window awnings, entertainment stereo system, ducted air conditioning and furnace. The sofa folds out to make a bed (not the jackknife style) and the dinette can also be converted to a bed. There is storage under the bed with gas cylinders to hold open. The carpets have been replaced and the couch and dinette cushions have been reupholstered. It has an electric tongue jack and scissor style stabilizer jacks on the corners and skates on the rear. Two 30 pound propane tanks with cover included. The slide out also has a cover that extends and retracts with the slide out. A Reese “dual cam” load leveling hitch and anti-sway system is included. Approximately 7000 lbs. dry weight. It has been stored under cover, is clean and well maintained. The main awning mechanical assembly and fabric were replaced. All appliances have been functional checked are in excellent working order. The original manuals and paperwork for the trailer and appliances are included. This unit is in excellent condition.